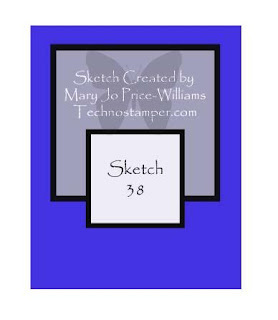 Another Monday...Another sketch from MJ at TechnoStamper. I took a little creative liberties with this weeks sketch - as made it work with the image I was using. I used the Marker Wash technique from a past TJNL on my focal panel, the sentiment is just stamped in Black Archival. The panels are sponged it Chocolate Chip, to add some aging. Here's MJ's original sketch, if you'd like to play along, leave your blog link on this post, or if uploading to SCS, use keyword TSSC38. This is such an awesome image. I love all of the new ODB stamps! You did a wonderful job coloring it. Beautifully done. Thanks for playing along.--as always, lol! Lovely...as always!! 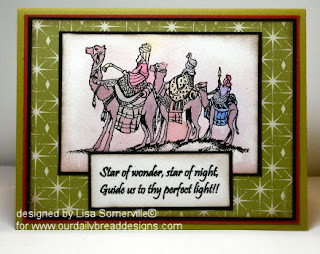 Beautiful card....I see you are getting a jump on your holiday cards. Good for you....AND Great job!! Such a pretty card Lisa!! Very neat card! I wish I could see the color wash better, I tried clicking on the image but it wasn't much bigger...I love that you do all sorts of neato techniques~!